This filter seems to both multiply and respect the alpha of the input. Mathematically robust blending mode for normal maps, using Reoriented Normal Map Blending. Copies the previous layer exactly. Useful for when using filters and filter-masks. This is a blending mode that will just copy/blend a source channel to a destination channel. Specifically, it will take the specific channel from the upper layer and copy that over to the lower layers. So, if you want the brush to only affect the red channel, set the blending mode to ‘copy red’. This can also be done with filter layers. 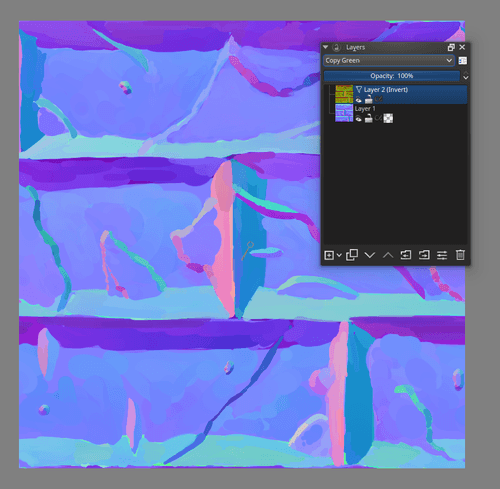 So if you quickly want to flip a layer’s green channel, make an invert filter layer with ‘copy green’ above it. Instead of using transparency, this blending mode will use a random dithering pattern to make the transparent areas look sort of transparent.